As I’ve gotten older, I’ve learned that the better you treat your equipment, the long it’ll last. And with something as expensive as cars, you can’t go wrong there. So if you’re looking for a great way to make sure your car is really clean and doesn’t get coated with dirt and grime for months or years on end, then these hacks will definitely help you out. Down below I found some awesome tips done by great bloggers. They’re all extremely helpful ideas and super easy to do. So check them out and let me know what you think (and don’t forget to check out the original source too!). This tip for washing your car with hair conditioner is seriously genius. Hair conditioner has lanolin in it (a type of wax), which will make your car shine.. and save you money since you don’t have to buy expensive car wax. 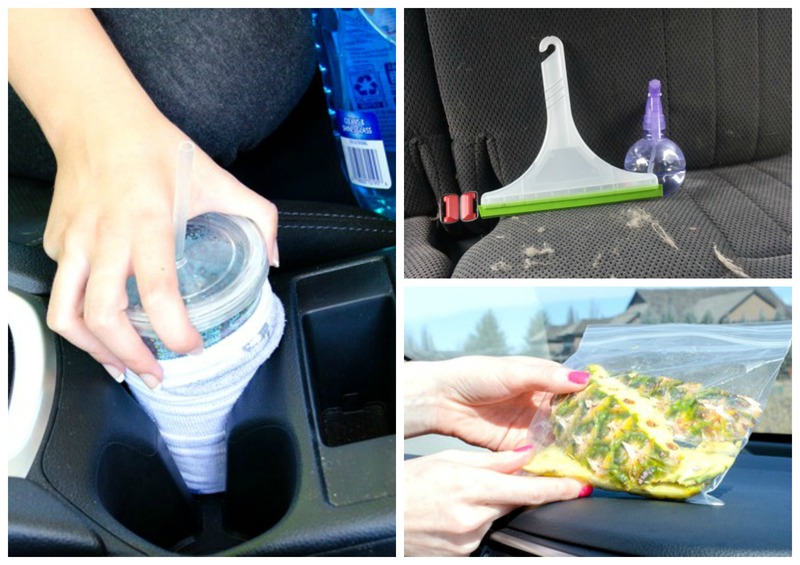 Alright, so I really like this idea of making sure that the cup holders stay clean. Gunk can so easily get down in there that it can be a pain to clean. But just having these cupcake liners in there can save you some cleaning time. If you want a good way to clean up the sticky messes in your car, then try this tutorial to clean up your vinyl and leather with a magic eraser. Dusting is pretty easy, but not if you have a cloth that spreads lint everywhere. So try using coffee liners when dusting your car! Easily clean your headlights with baking soda toothpaste! Its rougher texture will help to get all the grime off. Make sure that when you’re cleaning your windows, you roll them down to make sure that all of the grime and dust gets cleaned off. A can of compressed air is a simple and fast way to get the dust out of your vents and start breathing cleaner air. If you have pets that you take in your car frequently, and you’re tired of seeing their hair build up, try using a spray bottle of water and a squeegee. It’s a great way to gather it up and get rid of it easily. Let’s be honest, those cup holders can get pretty grimy and gross. But just attaching an old sock to a travel cup and wetting it with Windex can be an easy way to clean them out. Just twist it around in the holder, and anything stuck on will come off! If you’re noticing all of the dirt that’s built up over time in the crevices, then definitely get that out too. And you can easily do this with a flathead screwdriver. If you want to make sure everything is picked up by the vacuum, then try rolling up the seats to get all of those crumbs out of there. If you like pineapple, you can cut one up, eat it, and put the rinds in a plastic bag to give your car a tropical sweet scent. If you notice a persistent bad smell in your car, it might just be your filter! So check it out and get it changed. It’ll probably solve the problem! If you want a simple way to get those nasty bugs off the front of your car, then try dryer sheets. Another great way to make a natural air freshener is to put 5-10 drops of essential oil onto a clothespin, attach it to a vent, and let it blow the scent around the car. Pretty genious if you ask me. Cleaning cars doesn’t have to be hard, in fact, if we know the right tips and tricks, it can be pretty darn easy. Seriously, who said car cleaning (especially deep cleaning) had to take hours? With these hacks, you’ll be able to finish in no time and have your car looking and smelling like new. Love the tips, didn’t know any of this. I’d like to learn more about it! Since I’m a clean freak ! Which filter are you referring to about bad smell? They call it a cabin filter when you shop for it. I love your ideas and am going to try most of them in the next week. Do you know how to remove dog slobber/drool from the hard vinyl sides. I’ve tried enzymes and home made mixtures and nothing really cuts it. Glad you liked them! And I’m not sure about that one Peggy. Loved your tips. Would like to share a couple of my favorites if you don’t mind. 1. Use motorcycle windshield cleaner for plastic headlights. 2. Use baby oil and cotton swab to remover road tar from the car exterior. What do you do with the pineapple rinds? I use baking soda with a little bit of water or glass cleaner to get that dog drool and snot off bowls, and storm doors and car windows. It should work well with vinyl, though test it on an inconspicuous spot first. To prevent those spots on my car seats, I cover them with a blanket made for car seats. It has elastic to hold it in place. Or you can make your own with an old blanket and either sew or tie enough elastic (found wherever sewing materials are found – even in discount department stores and some dollar stores) to go around the seats to hold the blanket in place and keep the dog from sliding around. If possible, tuck the blanket in between the seat bottom and seat back to make it more secure for larger dogs. If you have leather seats, do not try the baking soda trick. It can leave unsightly stains. Use the blanket. If you have a large dog, it might require tucking each time your dog gets in, but that’s better than having ruined leather. Hope that helps someone! Thanks for your awesome tip Mac! That’s seriously helpful!